Are you one of the poor suckers who paid $30-40 for Ground Zeroes and were ready for The Phantom Pain to make up for your disappointment with what was little more than a glorified (and over-priced) demo? I wasn't, because I got Ground Zeroes for free from my PSPlus subscription around the same time that Phantom Pain was released. I was obviously disappointed with the demo's short length, and I didn't bother doing any of the side missions. But since I didn't pay for it, I wasn't as enraged as some other players might have been. I actually really liked what little gameplay Ground Zeroes had to offer. The Guantanamo Bay arena was well-designed and offered some good infiltration challenge that tested my Metal Gear capabilities. The A.I. was surprisingly competent and adaptive - not so much that I couldn't exploit them occasionally, but still good. The graphics, lighting, and weather effects all looked outstanding. It was a fun experience. Not "forty dollars fun", but pretty fun. 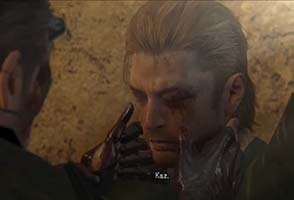 At least part of the battle at Mother Base should have been playable, and I didn't like that large elements of the story were hidden away in collectible audio tapes, but whatever. I got Ground Zeroes for free on PSPlus, instead of paying $30-40 MSRP for a glorified demo. Ground Zeroes gave me flashbacks to the phenomenal classic Sons of Liberty demo that came packaged with Zone of the Enders on the PS2. At least that only cost me a $3 rental, and I got to play Zone of the Enders too. After Ground Zeroes, I was looking forward to getting my hands on the much bigger Phantom Pain, and was optimistic that it would provide an equally good experience that would be worth the purchase price. Phantom Pain is a very long, very complicated, and very uneven game. So buckle up, friend. This is going to be a long review. Online play influenced by ... Demon's Souls? Metal Gear Online ... without the "Metal Gear"
Destined to be Kojima's magnum opus? Or his black sheep? After having written a lengthy blog post about how open world, sandbox game design almost necessarily puts the game's narrative in a state of limbo, I was amazed to start up Metal Gear Solid V and see the very first mission took my criticisms to heart. Of course, the game had already been released by the time I had written that opinion piece, so I can't take credit for having influenced its development, but it was still refreshing and gratifying. 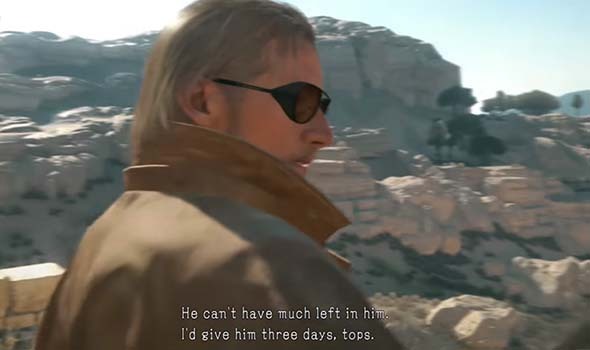 Anyway, in the very first mission, Ocelot tells you that Miller has been captured by Soviets in Afghanistan, has been tortured for intel, and has three days - tops - to live. You must rescue him before that time. 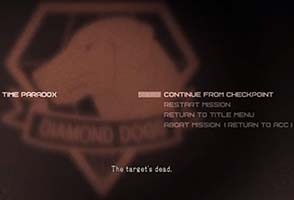 At first, I didn't put much stock in Ocelot's claim. After all, sandbox games are notorious for saying that something needs to be done ASAP, but they never have the balls to actually walk the walk and enforce that objective. Until now. When checking my map, I noticed something in the corner that I hadn't noticed in other sandbox games before: an "elapsed time" counter. The game was plainly tracking how long it was taking me to complete the primary mission objective. I treated this timer with a certain degree of skepticism. But sure enough, failure to rescue Miller within the allotted time actually results in a "Game Over"! This is exactly how I feel that priority objectives in open world games should be handled: make it apparent to the player (through dialogue and/or explicit notification) that an objective is being timed or that it is otherwise a priority, and make sure that there are reasonable, perceivable consequences for failure to achieve that objective within the expected conditions. Then design some early-game quests or objectives such that the player is put in a position in which they can (or must) fail; thus, teaching the player that when the game says "do x or else", the game actually means it. I put down the controller and gave Hideo Kojima a standing ovation. But would this opening mission set a precedent that priority missions must actually be prioritized, and would that precedent stand throughout the rest of the game? Or was this just a one-off occurrence that would not be representative of the rest of the game? Regardless, a tone was plainly set for the rest of the game, and the stakes had been raised. ... Failure to rescue Miller within the allotted time results in his death and a Game Over.